Have you ever wondered why your curly hair is always dry? There are a variety of reasons for this. Curly hair doesn't hold moisture the way straight strands do. Due to the coiled shape of the strands, your curl's natural sebum has difficulty making its way down the shaft. In order to keep your curls hydrated, they'll need some extra help. 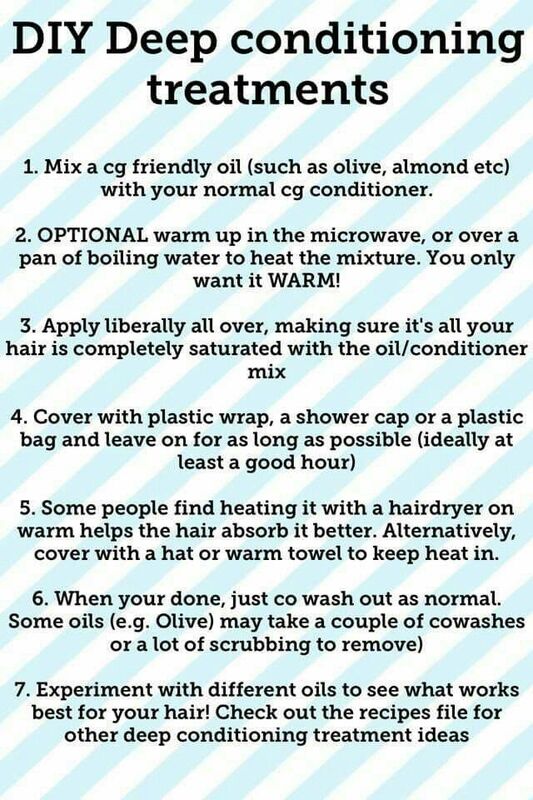 Here is a DIY deep conditioning for curls. You can make this mask with items you already have in your kitchen. Give it a try and let us know how it works for you. Take 1 cup of your favorite conditioner. Mix in 2-4 tablespoons of your favorite oil, such as jojoba, olive, or almond oil. Whisk until completely smooth. You can opt to warm this treatment up in your microwave. Go slowly and stir every 20 seconds to avoid overheating it. Test before applying to avoid burns. Wash your curls in warm water with a gentle cleansing shampoo. Make sure to massage your scalp in slow circles to break up oil and build up, therefore allowing your scalp to breathe. Section your curls and apply the deep conditioning treatment liberally throughout your hair. Make sure to cover all strands. You want all your strands to be completely covered. Cover your curls with a plastic shower cap and wrap your head in a warmed towel. Leave on for 2-3 hours to allow the conditioner to absorb into your strands. If you'd rather not use a towel, you can heat your hair with a hair dryer or a steam hood while using this treatment. The heat is essential for allowing the treatment to penetrate into your strands and for your hair to soften up to maintain the moisture. Once you've allowed your curls to sit, wash the conditioning treatment. You can rinse it away with cool water, which will close the cuticle back down. Some of the oils you might use can take a couple of washes to get out. For heavier oils like olive, you might want to avoid applying it to your roots. Learn more about curly hair products here.